O-rings can be damaged by chemical, thermal, or mechanical attack. By understanding the cause of O-ring failure, proper selection of an alternative elastomer or seal design can help improve seal life. Very aggressive chemicals attacked the basic polymer structure of this o-ring. The surface has blisters and cracks with numerous internal fissures and is dimensionally elongated. Process chemicals may attack the polymer chain or the elastomer crosslink. The cross linking system holds the polymer chains in place and gives the elastomer resiliency. Signs of chemical attack are blisters and splits. The surface may be shiny or feel tacky. This O-ring has suffered extreme damage, including compression set, cracking, and splitting. Exposure to temperatures near or above the temperature limit for extended periods of time can result in hardening, showing radial cracks if the elastomer is flexed. Thermal expansion may exceed the groove volume. 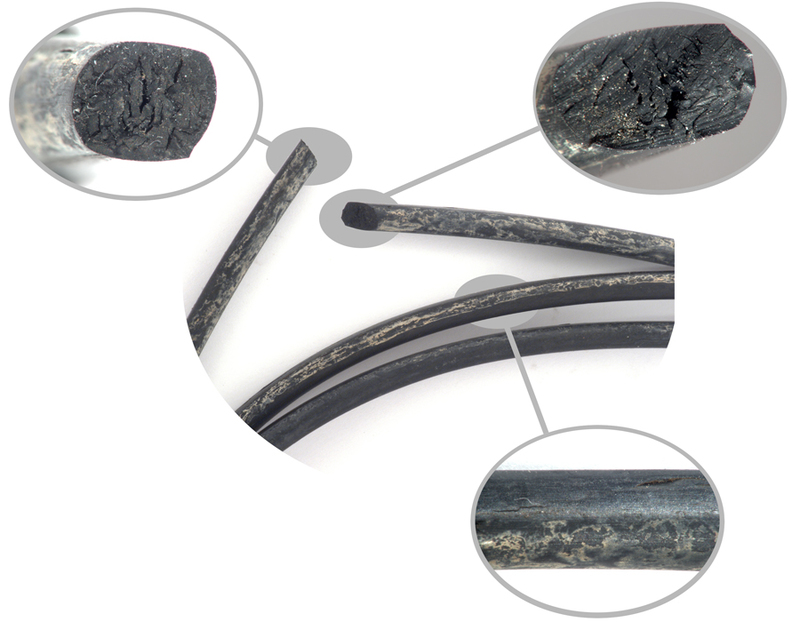 Elastomers are rated with an upper temperature, measured in hot, dry air. They may also be over-rated. Process chemicals often result in lowering the functional upper service temperature. Thermal failures should be considered any time an elastomer is used within 25 degrees C of its upper service temperature. Ask suppliers for long term data (500 hours or longer) on high temperature exposure. This can occur due to improper seal design or incorrect compound selection. Incorrect installation may result in cuts and spiral failure. This O-ring was flattened out and split when a PTFE o-ring was replaced by an elastomer o-ring. PTFE O-rings are designed to be crushed. The elastomer was compressed more than 30%, almost twice the suggested value. Proper equipment design, groove design and/or proper elastomer installation procedures can minimise the chances of part failure. Successful seal performance requires careful consideration of process conditions, elastomer properties and seal design. A deficiency in any one of these areas will result in a reduction of seal service life. If a seal failure does occur, a systematic approach should be taken to determine the root cause of the failure. This can occur in high pressure applications that have experienced a rapid depressurisation. The o-ring typically exhibits blisters as well as internal and external cracks/splits. A fluid penetrates the elastomer and saturates it, at high pressure (typically greater than >750 psi); and, during rapid depressurization of the system, causes damage to the o-ring. During depressurisation, the “dissolved” gas rapidly expands, and if it cannot rapidly diffuse out of the elastomer, it may cause blisters (mild attack), cracks, splits or blow apart the ring. The splits and cracks can appear externally as well as internally. Carbon dioxide is an excellent example of a problem gas system that can result in explosive decompression. This problem will only occur in high pressure systems that experience rapid loss of pressure; for example, a drop of 1000 psi in a few minutes or less. Some elastomers formulations have better explosive decompression resistance than others. Typically, high hardness elastomers, with high filler loadings are used for these applications. It is also helpful to design the groove so the elastomer seal fills the groove cavity during operation. The best preventative measure is to always depressurise systems slowly if they are prone to damaging elastomers by explosive decompression.